Are you located near a costume shop? If the answer is yes, please post pics of the shop's Mask Section. Freakin great idea Eric! I may be heading to Fat Mans Forest in Augusta in Sept. so I'll definately bring my digicam along. I'd love to see pics from all across the nation. I know some of you guys have some great connections. Heck yea! I'm hoping Fat Mans has some of the 90s DPs this year. I know they had about 3 last year - mummy, ghoul, and carlisle. I'll let you guys know if I get lucky this time. Are you in Augusta? Sweet... go by if you can and let me know if they have anything worthy this year. 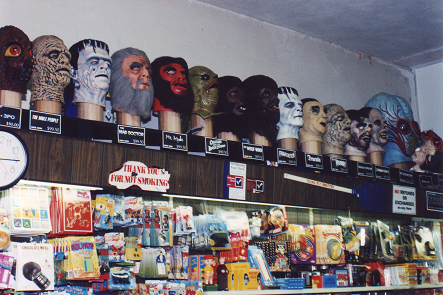 When I was growing up I'd go there every year and they had all top notch masks. They've slipped a little (as most mom and pop shops have) but its still a blast to go there and get some boiled peanuts and walk around. I used to love the Fat Man's Forest of Frights back in the early 90s... but they tore it down I think. Ah, the good ol days. Sure thing maybe they will let me take some pics..
NOW THAT'S WHAT I'M TALKING ABOUT! GREAT JOB KOLCHAK!!!!!! That is one fine looking DU Krem in that first picture! Thanks so much man! Fantastic pics as usual, Huna! I love the pic with all of the reissues lining the wall. Sadly, all of the great costume shops of my youth are now gone from this area. Our town seems to only want to support the likes of Walmart and Spencer Gifts . When I was a kid, every year around this time I'd have my Father drive me downtown to the local tuxedo shop. During this time of year the shop would transform itself into a veritable mask heaven! This was the store that introduced me to Don Post, Distortions, Be Something Studios, and many more. They always had great window displays, complete with Dracula, Frankenstein, and other ghosts and ghoulies. One of the mainstays of their window display was their Dracula, complete with coffin. 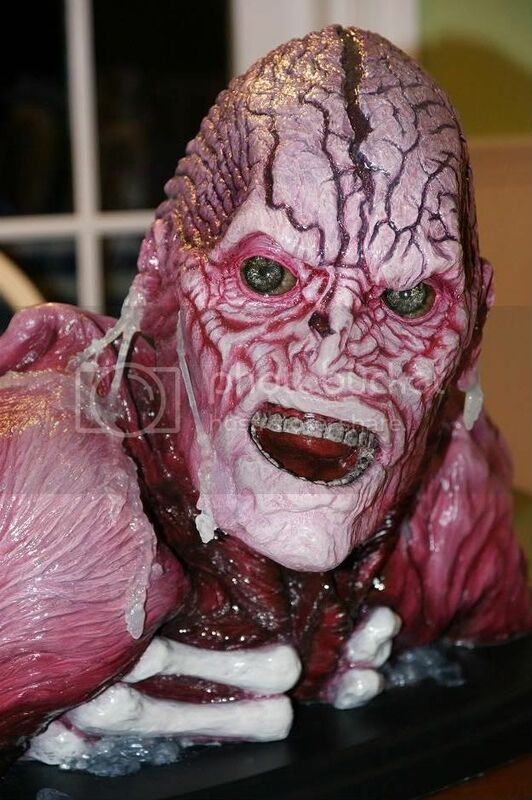 The mask used on the Dracula figure was none other than Don Post's version of Christopher Lee! To make a long story short, over the years I must have stared at that mask for hours. On one crisp, October saturday my Father took me to the shop and shelled out $60.00, so that I could finally bring the mask home with me. Unfortunately, the mask is no longer with us, as it was used in my annual, yard display every year. Even though I no longer have the mask, I'll never forget the excitement of going to the costume shop with my pops, and buying Dracula! So, looking at pictures of costume shops. etc., brings back great memories of October's past.